The next time you need a teacher gift or thank you gift consider making a rainbow theme gift pail. This project is so easy and is just so fun! Start with the clear paint bucket style pail and cut a strip of paper that will slide snugly right into pail and overlap a bit. Next fill pail with candies or small gift. Then decorate the top of the lid with a fussy cut hedgehog and smile sentiment, layering as shown. 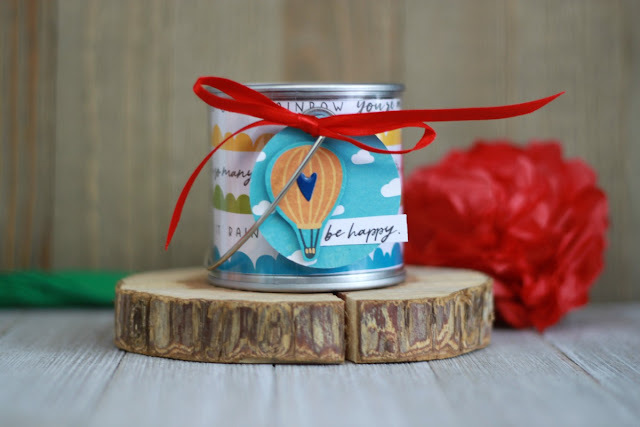 The next step is to use a circle punch to create the tag and fussy cut a hot air balloon and sentiment such as “be happy “to attach to tag. To dress up the tag add an epoxy sticker as pictured, then last add a bright red ribbon tied into a bow. There you have it, a little pail full of happy.